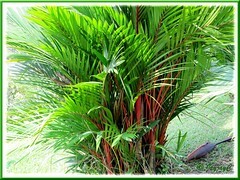 is one of the most beautiful and striking clumping palm that’s admired by many. 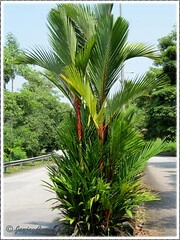 A must-have exotic palm specimen if you have the garden space! Last October, while taking photos of the Lipstick Palm trees that were growing in our church’s compound to include in our C. renda article here, John and I noticed that there were numerous suckers just waiting to be adopted. So we approached James, the gardener, to give us some with the hope to propagate them for sale at our SFA Church’s Sunday Bazaar in aid of an ongoing church-building fund project. He gave us 4 young plants as seen in the first image below but sadly, only the one that had a couple of roots survived. And that successful one sure took its own sweet time to let us know that it’s kicking and about. Since it was pointless to follow through with our earlier plan with just a single plant, we decided reluctantly to keep the loner for our garden instead! Not that we’re not captivated by this stunning and majestic Lipstick Palm with its vibrant red stems and its lush green foliage, but we’re fully aware that it grows best on the ground. That’s something our young plant will miss as our ground is mostly paved and in the pot it’s forced to stay, restricted and contained…poor darling! Collect some seeds, best fresh seeds that will germinate between 1-4 months. Dried seeds can be used too but may take up to 9 months or later to germinate. Soak the seeds for 1-2 days, preferably in warm water or scarify them to speed germination. Then, scatter or plant them with their top partially exposed above the soil, into your garden bed or in a container filled with humus-enriched potting medium. Site them at a sunny spot. With good heat and sunshine, plus regular watering, seeds should germinate successfully. 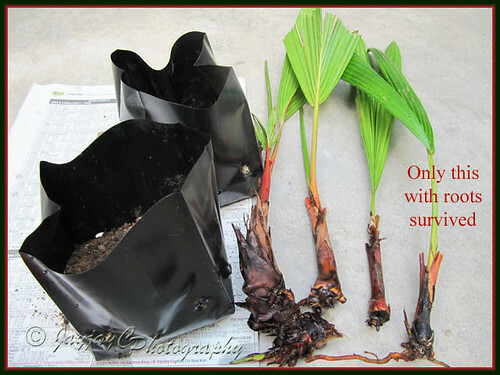 More details on how to propagate palms in general by seed germination here. Suckers will emerge freely in abundance from a single parent plant, eventually forming a clump of them. Use appropriate gardening tools, such as a very sharp spade or shovel to cut through and divide the clump. Then, grow the divided clumps separately as newly grouped plants in garden soil that is enriched with humus and well-drained. 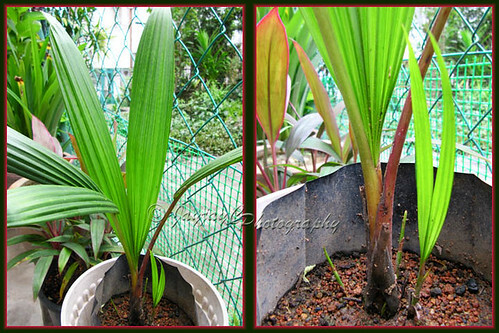 Best to divide the clumping plants when they are young, otherwise it’ll be one very tough job to tackle, as seen in this post on propagating the Rhapis excelsa (Lady Palm), another clumping palm. 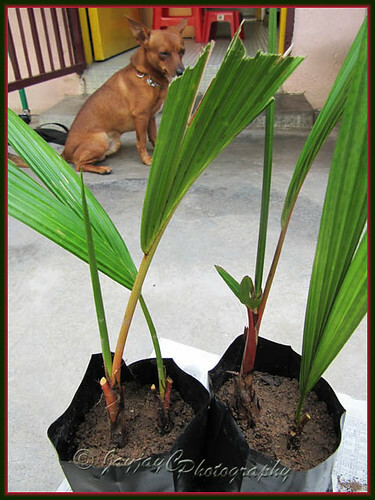 Use appropriate digging and cutting tools, like the hoe or ‘cangkul’ (Malaysia’s equivalent of a hoe) and a sharp knife/pruner, to sever the side suckers or shoots from the main plant. Make sure that each young plant has a healthy set of roots otherwise it’s doomed to fail as we’ve experienced in this project that was started on 10 November 2009. Replant them singly or 2 shoots together, in a container or directly into the ground, using good-draining and humus-enriched potting medium. Plant each shoot with its crown at the previous soil level and firm the soil well around its stem. Then, wet through thoroughly. Best to site them at a sunny spot and with good sunlight and generous watering regularly, they should flourish well as new plants that will eventually produce new shoots too. The left photo below shows its progress about 5½ months later. Height hardly increased but it had produced a new leaf and a teeny-weeny shoot had emerged! 2 months later, it had added another new leaf as seen in the right image. It’s normal for these newly propagated young shoots to grow ever so slowly, remaining small and will begin to pick up growth-pace gradually. The photo below illustrates how slow the young plant had grown within 8½ months – just added 2 new leaves and 3 shoots, with hardly any change in height. If it’s planted in a small pot, it’ll probably take up to a year or more for them to be pot-bound. Repot it when the time is right, especially if roots are popping out from the drainage holes – choose a heavy and fairly deep container that can support the weight and expansion of the clump. 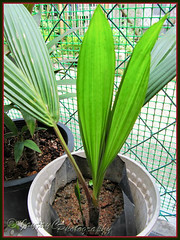 One where the palm can reside for several years without needing to be repotted unnecessarily. Or simply transfer the palm directly into the ground. 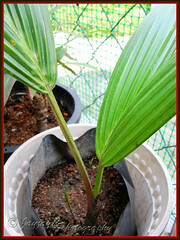 This propagation technique of severing or separating the side shoots can be used for other clustering palms too, such as the Macarthur Palm and Lady Palm. Its strange to note that whole palm tree is covered with little ones – sort of like overcrowded and suffocating the parent plant. But the moment you remove them from the “clutter” they tend not to thrive. Its a pity that only one survived from the collection. Sometimes I collect these spouts by the roadside – where the palm seedling barely survive from the very limited soil area – but they still don’t survive after the transplant. So much so – I have given up with palm trees. Regardless, I really love that flashly red stalk on the palm – really gives the impact with the green leaves. Appreciate your visits and comments, James! You may want to give it a last try with this red beauty….get a sucker together with its roots and you’re sure to succeed! I have to warn you about this beauty. I have 3 in my garden, planted on the ground. It’s roots are quite invasive, coming out everywhere and seeping into other flower pots to ‘steal’ nutrients. The suckers appear quite vigorously and I have to continuously cut off the top part, otherwise it becomes too crowded and occupies a lot of space. If you trim off the suckers, the few remaining trunks will grow tall which is what I wanted. Having said that, the palms do add an exotic tropical touch to the garden. Some birds like to build nests there too, and I just love to hear the sweet sounds of the tweetie birds every morning when I wake up. I do agree, Autumn Belle…this beauty is truly invasive! Recall planting them on the ground, probably a decade ago and cracked our drains too. Now that the seedling is potted, hopefully will keep it contained though sure to break its home in due time. Thanks for visiting and sharing some insights. Good night and have a great week ahead, my friend! I first saw this incredible looking palm trees on my visit to Malaysia. I want one for my garden, will this grow in California? I have not seem them in any garden here and i am wondering if it is even possible to grow them here in Los Angeles. We really don’t know, Cesar! But researching online, we read that this tropical Lipstick palm is extremely cold sensitive, hardy only for Zone 11 and will be killed if temperature should drop below 10°C. Footnote to above comment – I have heard of a guy growing Lipsticks in the Miami area of south Florida which has a similar climate to where I live. But be carefull even in south Florida. One severe cold snap over just a few days can kill these palms!!! Hola vivo en Cali, Colombia y tengo en mi jardín una bella palma roja o lapiz labialmqu esta muy bella, estoy leyendo sobre su propagación, ya que quiero regalarle a una amiga, pero me preocupa que se vaya a enfermar mi palma. Thanks for sharing your experience, Soraya! This palm is very hardy, so not to worry, yeah. Thanks for sharing your experience with this red beauty. I’m sure many gardeners from your neck of the woods will find your info useful. Thank you so much for taking the time to share your growing experience of this beautiful palm, with much details. God bless you for your generosity. In Puerto Rico is very easy to grow this palm, we have two on our front yard that have 11 years old but is getting talller and bigger to the side. We want to get the suckers out (we here call them hijitos) to trasplant but they are so sensitive and died very quickly. I’m going to try one more time digging more deep to take off one with the roots and transplant. Thank you for the easy explanation. May God help us growing more and not to just cut them. Nice to know that you like this exotic palm too. Hope you are able to get another young plant with roots to ensure success. All the best to you. Interested in buying red lipstick baby trees. How much & for how many of them? Also how do I purchase this from you under what description? Sorry, we’re just home gardeners and not retail sellers for garden plants and products. I love lipstick palms,back at home in Uganda(Africa)I carefully seperate them from the mother plant so that I don’t run out of my main stock.try it. I live in Fort Lauderdale, Florida. About six years ago in 2012 I purchased a mature lipstick Palm that was about 8 feet tall in its container. I now have 5 mature plants each up to 10 feet tall. I have propagated at least 10 small plants and have given some away to friends. I water them every day and cover them when the temperatures drops below 50. I recently got new seeds that are probably close to 1000. Not sure what to do with them all. I’m trying to see how that works to start plants from seeds, however, I’m not holding my breath. I’ve done well with the larger plants. I’ll be happy to share pictures. Hope you’ll succeed in propagating the suckers this time around. All the very best in your endeavour.